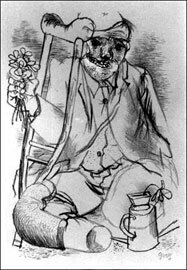 Of all artists who served as soldiers in the Great War, George Grosz stands out as one whose life was really incredible. 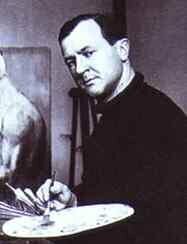 George Grosz was born in Berlin in 1893. On the outbreak of the First World War he volunteered for the German Army. In 1915 he was released as unfit for duty. However, in 1917, desperate for soldiers, Grosz was conscripted again. Kept from frontline action, he had to transport and guard Prisoners of War. After trying to commit suicide in 1917, Grosz was send to an army hospital. Then he was court-martialed for insubordination and sentenced to death. One of his patrons, Count Kessler, saved him from execution. He was now diagnosed as suffering from shell-shock and was discharged from the German Army. After the war Grosz became a famous expressionist painter (DaDa-movement) and he was a leading anti-Nazi activist. A great deal of fuss arose when he published a shocking portrayal of Jesus Christ wearing a gas mask and army boots with the caption "Keep your mouth shut and do your duty", in 1924 in an album titled Hintergrund (Backdrop). The images in this album are of utter loneliness and despair. They not only depict the brutal reality of human condition, but also its radical hopelessness. Charged with blasphemy Grosz was at first found guilty but was then acquitted in 1932 during an appeal. Grosz spent six months in Soviet Russia, meeting Soviet notables and observing the Proletariat Dictatorship firsthand. Disillusioned by what he had seen, he became gradually estranged from his left wing compatriots, devoting more of his energies criticizing totalitarianism in all its fronts. In 1933 his former communist friends branded him a “petty-bourgeois traitor and renegade”. Neverthelesss the Nazi's came after him and in 1933, after being harassed by Hitler's Gestapo, Grosz fled to the USA. 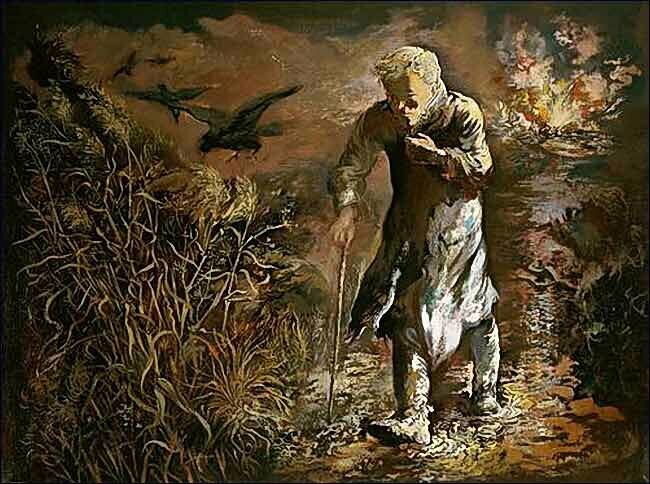 Here he tried to start a new life, but his war experiences did not stop haunting him - see the oil painting The Wanderer above and his drawing The Hero on the right. He was not happy in the USA. The society that had prompted his earlier work, Weimar Germany and the Nazi Party, had confiscated and destroyed his works and revoked his citizenship; in his new land, it was inferred, Grosz was lost and his art with him. He returned to Germany in 1959, saying "My American dream turned out to be a soap bubble", and died the same year.